The trees and vines are tired and dusty now, waiting for winter rain to clean the air and bring welcome moisture to their roots. On Sweet Home Ranch it is time to make jam and jelly from fruit cleaned, cut and frozen in bulk during the busy picking season. 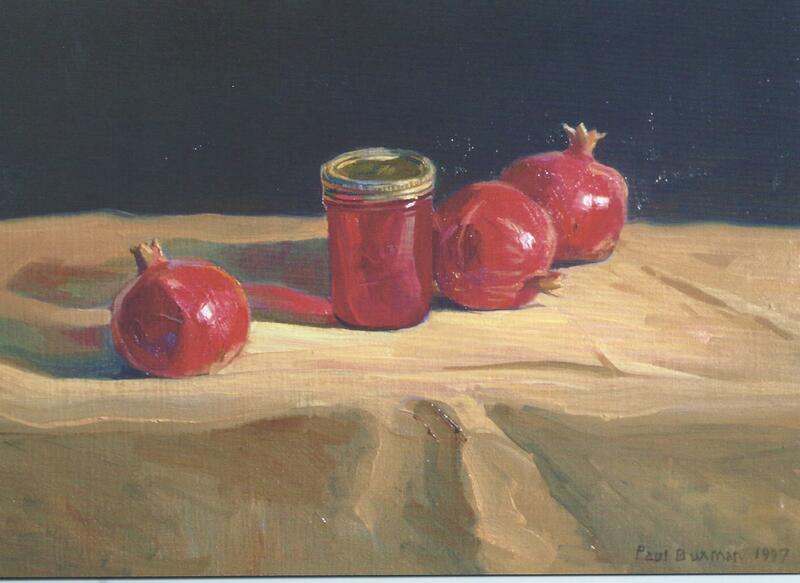 It is time to get ready for the art show and harvest festival Ruth and Paul Buxman host each year on the Friday and Saturday after Thanksgiving Day. Neighbors and other family farmers will bring their own specialties—jams, jellies, dried fruit, twelve kinds of bread, handcrafted cheese, locally made wine, honey, nuts and more. This year, a few copies of my book, The Gift of Laughter, will join the display of goods for sale, next to the boxes of Paul’s art cards, perhaps. Paul and Ruth have long been concerned about steady loss of their region’s rich farmland to commercial and residential development. 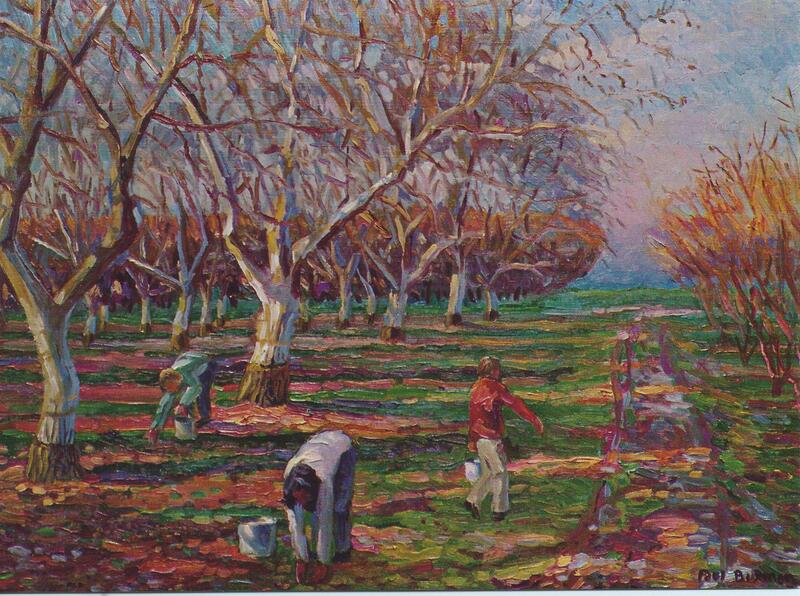 When the Sequoia Riverlands Trust, “a regional nonprofit land trust dedicated to strengthening California’s heartland and the natural and agricultural legacy of the southern Sierra Nevada and San Joaquin Valley,”* was established in 2009 they traded the development rights on their farm property for one the first two farmland conservation easements in Tulare County. Sweet Home Ranch is now dedicated farmland, a real victory. But their concern is not just that their land remain farmland. The concern is for the kind of farming done on the land—sustainable, environmentally friendly farming. They want their farm to remain a family farm. Earlier this year Ruth and Paul sold Sweet Home Ranch to the young couple who owned the adjoining farm. Farming is hard, hard work, and the ranch had become too much for them. They have not completely retired, though, not retired at all. They retain a life estate on their house, its outbuildings and about a quarter of an acre of trees. They will have enough fruit to give away to friends, which they enjoy doing. They will continue making jam to sell through the outlets they’ve established over the years. They will continue hosting the Thanksgiving weekend Harvest Festival. But Paul now has more time to paint, and they have more time to give to all the volunteer work they do at Reedley First Mennonite Church, Reedley Peace Center and whatever the opportunities they see to help meet the needs of people around them. Paul and Ruth’s retirement does not mean the end of Sweet Home Ranch. It is still there, beautiful, productive, a working family farm. To know that it is there and has a good chance to survive into the coming generations makes me deeply happy. Delightful paintings and remembrances of the past.